Labelette Model APS106, automatic, inline, pressure sensitive wrap labeler rated from 10 to 175 containers per minute – depending on materials and application. Label size range: 0.5" to 11" in Length x 3/4" to 6" in Width. Container size range: 7/8" to 4- 3/8" in Diameter and up to 14" in Height. Equipped with 84" long x 6" wide plastic delron chain product conveyor with product separator bump wheel, Labelette label head with 17" long x 6-1/2" high wrap station. Control panel with touch screen controller, stepper motor drive, power assisted label web take up, 8 speed selection, on / off push buttons with e-stop and embose coder Mounted on a welded stainless steel H-style base frame. Labelette Model APS106, automatic, inline, pressure sensitive wrap labeler. Label size range: 0.5" to 11" in Length; 3/4" to 6" in Height. Container size range: 7/8" to 4-3/8" in Diameter; up to 14" in Height. Equipped with 84" long x 6" wide product conveyor, product separator bump wheel, 17" long x 6-1/2" high wrap station. Touch screen controller, stepper motor drive, power assisted label web take up, 8 speed selection, E-Stop. Speed dependant on materials, application and machine configuration. 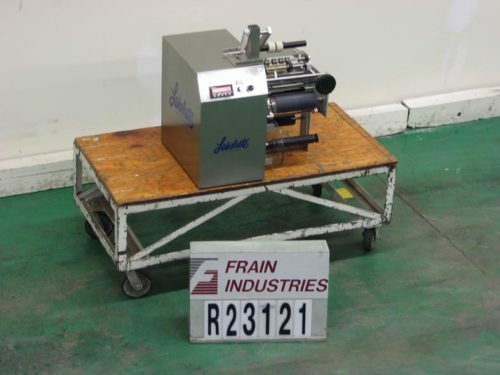 Labelette Model AP108, automatic, inline, pressure sensitive one side or wrap labeler with number of container per minute – depending on materials and application. Label size: 0.5" to 11" in Length; 3/4" to 8" in Height. Equipped with 78" long x 6" wide product conveyor, bump wheel separator, 9" high peeler plate and 22" long by 8-1/2" high wrap station. Touch screen, stepper motor drive, power assisted label web take up and e-stop button. Mounted on stainless steel base frame with height adjustable legs. Automatic, inline, pressure sensitive wrap labeler capable of speeds up to 175cpm ( depending on dia of container, and length of label). Label size range of: (0.5" – 11"L) x (3/4" – 6"W) and container size range of: (7/8" – 4 3/8" dia) up to (14" H). Has a (84" L x 6" W) plastic delron chain product conveyor with product separator wheel, and a (17" L x 6 1/2" H) wrap station. Touch screen controller, stepper motor drive, power assisted label web take up, 8 speed selection, on/off buttons with e-stop, mounted on a welded stainless steel tube frame. Labelette Model SG, semi-automatic, stainless steel hot skip glue wrap labeler rated from 0 to 50 containers per minute – depending on materials, application, machine configuration and operator dexterity. 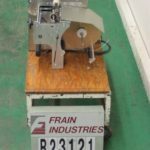 Designed to do spot, face, 3/4, or full wrap labeling of sheet of cut paper labels with label size range of 1-3/4" to 7-3/4" in Height x 3" to 20" in Length, and container size range of 1oz to 1 gallon. Equipped with 24" long x 8" wide adjustable label feed table with overhead pressure arm, automatic label feed to 360 degress, label guides (2) label feed rollers, 8" long rotary glue roller with finger bar applicators, adjustable skip glue, removable glue pan, one set of label guides and hand crank adjustable. Control panel has heat temperature, and drum and glue controllers with read out, speed control dial on / off switch and e-stop. Mounted on (4) leg frame with locking casters. 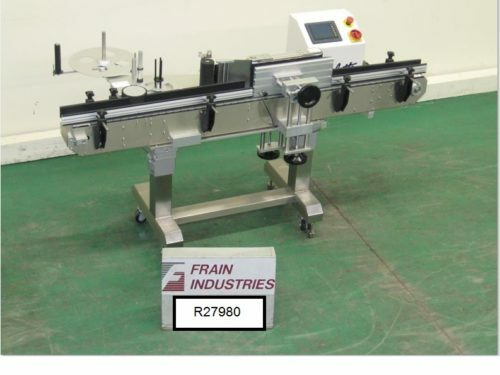 Automatic, inline, pressure sensitive wrap labeler. Label size range: 0.5" to 11" in Length; 3/4" to 6" in Width. Equipped with 84" L x 6" W delron conveyor, product separator wheel and a 17" L x 6 1/2" H wrap station. Touch screen controller, stepper motor drive, power assisted label web take up, 8 speed selection, on/off buttons with e-stop, mounted on a welded stainless steel tube frame. Speeds dependant on materials, application and machine configuration. Labelette, Model 24-APS-108, automatic, in line stainless steel, pressure sensitive, stepper driven wrap labeler. Rated from 20 to 175 containers per minute – depending on materials, application and machine configuration. Label size range: ½" to 11" in Length; ¾" to 8" in Height. Container size: (7/8)" to 6¼" in Diameter. Equipped with 72" Long x 6" Wide delron conveyor with adjustable guide rails, spacer wheel, 9" high label peeler plate and 22" long x 9" high belt wrap station. Touch screen controller with readout and E-stop. Mounted on stainless steel base frame with casters. Label Roll: 14"OD with a 3" core. Labelette, Model 24-APS-108, automatic, in line stainless steel, pressure sensitive one side / wrap labeler. Label size range: ½" to 11" in Length; ¾" to 8" in Height. Equipped with 72" long by 6" wide conveyor, spacer wheel, 8¾" high label peeler plate and 22" long by 8½" high wrap station. Touch screen controller and E-stop. Mounted on stainless steel base frame with casters. Label Roll: 14"OD with a 3" core. Speeds dependant on materials, application and machine configuration. Labelette PST40-200-00 semi-automatic, tabletop, pressure sensitive labeler capable 15 to 45 cpm -depending materials and operator. Label size range of: 3/4" to 22" in Length; 3/4" to 6 1/2" in Height. Container sizes: 1" to 7" in Diameter. All stainless steel constructed, high friction, non-stick silicone drive roller, bottle hold down arm and hand crank adjustments allow for fast change over.